A remarkable young woman plays baseball with tremendous skill in the early days of the 20th century. From the time she was a very young girl, Edith Houghton was an incredibly talented and dedicated player on the local Philadelphia sandlots, where she was valued by her male counterparts. When the Philadelphia Bobbies, an all-female (and all-white) professional team of young women, held tryouts, she made the team even though she was only 10 years old. Wearing a uniform that was so large that it had to be pinned and rolled up, she nevertheless proved herself on the field and at bat. Playing mostly against men’s teams, the Bobbies first barnstormed locally and then through the American West and on to Japan. Throughout it all, large, admiring crowds and the press had nothing but praise for Edith. 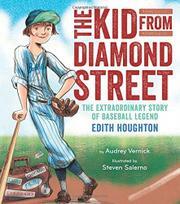 Vernick offers plenty of details about Edith’s life on the baseball circuit, telling the tale in a conversational tone that brings the events to life and indicating that the concept of women playing alongside and against men was, if not common, perfectly acceptable. Salerno’s illustrations, variously rendered in charcoal, ink, and gouache, as well as digital color, lovingly evoke the time period and the settings. Much fascinating information about Edith’s long and adventurous life is added in an author’s note.